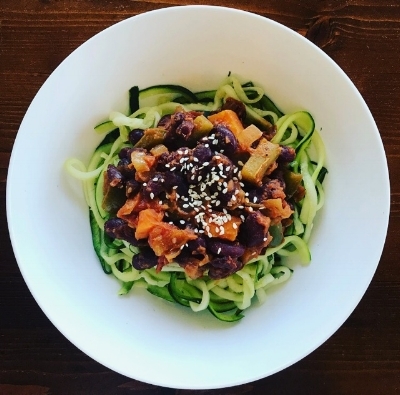 After a weekend where you may have enjoyed some of your favourite treats why not try this healthy meatless meal for Monday to get you back on track for the week! 1 can diced tomatoes or 1 punnet of chopped cherry tomatoes. 400 g tin of lentils or kidney beans (or soaked). 1/2 cup vegetable or chicken stock. Spiralized zucchini or your choice of pasta, to serve. 1. Sauté the carrot, onion, celery and garlic in the oil for 3 minutes over medium heat or until onion is translucent. 2. Add the lentils/kidney beans, tomatoes, stock, spices, salt and pepper and stir through. Allow to simmer for approximately 15 minutes with the lid on, stirring occasionally. 3. Add the chopped parsley and remove from flame. Serve with spiralized zucchini or your choice of pasta.